CHICAGO--(BUSINESS WIRE)-- Hyatt Hotels Corporation (NYSE:H) announced today the opening of Grand Hyatt Rio de Janeiro in Brazil. Grand Hyatt Rio de Janeiro combines the brand’s effortless luxury experience with a Brazilian design and hospitality in an urban resort setting. Guests can enjoy its prime beachfront location in the exclusive Barra da Tijuca neighborhood and access to world-class shopping, dining, cultural and outdoor activities. As the second Grand Hyatt hotel in Brazil, Grand Hyatt Rio de Janeiro is a significant addition to Hyatt’s existing portfolio in South America and the growing brand portfolio. The hotel is meticulously designed to exemplify the Grand Hyatt brand’s signature level of grandeur with an abundance of options for creating spectacular experiences. Every aspect of the hotel, from simple delights to elaborate gatherings, embodies the brand mantra of Living Grand, an expression of the ways in which Grand Hyatt hotels deliver extraordinary experiences and infuse care into every encounter. 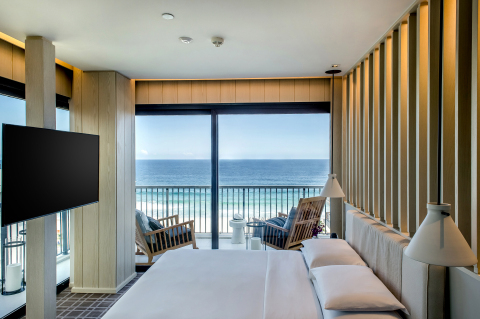 Grand Hyatt Rio de Janeiro’s beachfront setting greets guests with scenic views of the blue-green Atlantic Ocean as they turn into a private entry and dedicated garage facilities. Upon entering, a large vertical garden, one of 17 throughout the property inspired by Brazilian icon and landscape architect Burle Marx, welcomes guests as they make their way to the large wooden lobby doors. The spacious lobby flows through to the outdoor pool and garden areas, inviting the sunlight and ocean breeze into the space. Design highlights include mosaic floors, also inspired by Burle Marx’s sideway designs, and local artwork that set the stage for an authentic Brazilian experience. Designed by internationally acclaimed interior designer Yabu Pushelberg and with the local assistance of Brazilian designer firm Anastassiadis Arquitetos, the hotel provides a relaxed, carefree coastal living experience with large balconies and floor-to-ceiling windows, along with stones and fabrics authentic to Brazil. The 436 guestrooms include 40 suites, two 1,561 square foot Presidential Suites, and one 2,100 square foot Penthouse Suite with a 1,248 square feet terrace including a lounge area and a plunge pool. A special private elevator provides the Penthouse and Presidential Suites direct access from the garage. The stunning beachfront location affords all of the guestrooms views of the blue-green Atlantic Ocean or the magnificent Marapendi Lagoon that surrounds the hotel. Among the special local touches, each guestroom has Brazilian flip-flop sandals, and in the botanical tradition of Brazil’s oldest pharmacy, Granado bath amenities. A Grand Lounge, with ocean and lagoon views, offers a private reception space for Grand Club floor guests. Featuring separate adult and family areas, the Grand Club offers all day tea and coffee service, complimentary breakfast and evening cocktails. Grand Hyatt Rio de Janeiro also has a hospitality area due to the destination’s late airport departures and early arrivals; Marapendi Lounge welcomes early check-in and late check-out guests with shower and changing room facilities. Three signature restaurants, designed by acclaimed Brazilian architect Arthur Casas, will bring Hyatt’s culinary expertise to the destination and showcase choices that highlight international and local flavors. Offering three-meal service, Tano Cucina Italiana, is a modern Italian trattoria with an ever-changing menu incorporating seasonal ingredients. Its wooden beams and Italian floors blend beautifully with a wrap-around Carrera marble bar that frames the open kitchen. Diners can watch as chefs prepare fresh pasta, or they can enjoy a variety of antipasti and aperitifs from any of the other restaurant bars in this space. In an intimate dining room setting, Shiso Japanese restaurant features a single piece, reclaimed wooden bar that surrounds the sushi chefs as they create their contemporary sushi, sashimi and yakitori dinner menu. The restaurant will also offer an extensive sake menu to pair with its cuisine. Cantô Gastrô & Lounge uses natural materials to create textures throughout the space all the way out to its terraces, which open toward the pool and garden area. Offering a casual and creative take on local cuisine, Cantô offers breakfast and lunch and in the evening becomes a lounge with bossa nova music and an extensive Caipirinha cocktail selection. In the morning, guests will find fresh juices and padaria items such as pão de queijo, along with other morning favorites. Lunch creations reflect the Carioca cuisine, and in the evening, small plates ideal for sharing are on the menu. Grand Hyatt Rio de Janeiro’s extensive lagoon-view event facilities totals more than 21,530 square feet. The fully integrated conference and events center features two elegant, multi-purpose ballrooms, nine sophisticated meeting rooms with spectacular outdoor pre-function areas, and two exclusive loft kitchen areas will provide an extensive range of options for upscale meetings, conferences, social events and weddings of all sizes, complete with a dedicated staff to assist in planning and execution. Stunning views of the Marapendi Lagoon and the Barra da Tijuca beach complement the area’s unique features. The wellness facilities at Grand Hyatt Rio de Janeiro are resort-inspired with a range of treatments and amenities. Guests may opt for the 24-hour fitness center that has the latest high-tech cardio and strength training equipment or the Movement Studio which offers yoga and Brazilian dance classes. The Atiaia Spa, named after the native indigenous tupi-guarani word for luminosity, features six single and three couples’ suites all with private showers and changing areas. Spa highlights include specialty treatments using local techniques and native products, a relaxation lounge, private changing rooms, and steam rooms. The outdoor pool with a wet deck is a focal point in the middle of the property. Grand Hyatt Rio de Janeiro offers beach service so guests can relax and enjoy the views with a cocktail in hand. Paddle-boarding, sailing, kayaking and other non-motorized watersports are offered on the Marapendi Lagoon. The Gil Hanse-designed Olympic Golf Course is a 10-minute ferry ride across the lagoon, and nearby guests can explore the untouched beaches of Grumari or the surfing spots of Prainha of Rio de Janeiro, located just off of lush forest trails. Famous for its beautiful stretch of beaches and home to exclusive shopping and dining, Barra da Tijuca also has an important business community comprised of corporations and multinationals. Business and leisure travelers will benefit from a new and modern transportation infrastructure in the area. In addition, Cidade das Artes Concert Hall with numerous concerts, children's shows and exhibitions throughout the year is only 10 minutes from the hotel. Located nearby are Rio de Janeiro’s world-famous attractions such as the beaches of Copacabana, Ipanema and Leblon; Corcovado, the Christ the Redeemer Statute; and Sugar Loaf Mountain among many others. Around the world, Grand Hyatt hotels unlock the extraordinary in every moment by creating experiences beyond expectation. Located at the crossroads of local culture and global business within major gateway cities and resort destinations, each Grand Hyatt hotel is uniquely designed to reflect its own distinct environment and provides a hub for travelers and locals alike. Grand Hyatt hotels exemplify the pursuit of life lived grandly offering guests superior service, first-class accommodations and an abundance of options within a multicultural backdrop of dramatic architecture and innovative design. Grand Hyatt properties boast inventive restaurants, luxury spas, fitness centers, and business and meeting facilities. Grand Hyatt hotels stand to make every moment memorable through their commitment to #LivingGrand every day. For additional information or to make a reservation, please visit www.grandhyatt.com.